Interested in checking out my books? Here's the place to go! Jane Roberts never fit in. After years of teasing from her classmates, all she wanted was to blend in and be normal. But on Jane’s first day of fourth grade, her life changes completely when the new girl, Jenny, brings with her arrival the secret of magic. Jane goes into training, where she learns the ins and outs of magic and its great history. 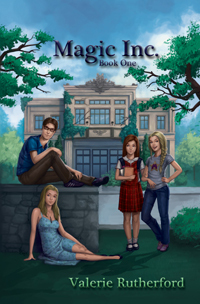 But not even magic can top the feeling Jane gets when she meets Chaz Parker, Jenny’s older brother. She’s head-over-heels and wants to be with Chaz forever, but a nine year age difference makes Jane wonder if he’d ever look at her that way. Between learning magic and falling in love, Jane’s year is bound to be anything but normal. Tragedy has rocked Jane Roberts’s life. As she tries to help the Parkers through their loss, amidst increasing bullying and painful visions, Jane feels only one thing remains the same: she is still convinced Chaz Parker is her Soulmate. Her feelings are stronger than ever and maturing rapidly in spite of her young age. But there’s a new problem… Chaz has a girlfriend. Desperate to see into her destiny, Jane makes a mistake which pulls her future into her present. 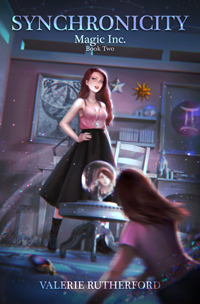 And it could change everything at Magic Inc.
How far will your obsessions take you? Jodi Thompson has been in love with her next-door-neighbor as far back as she can remember. After his disappearance, visions lead her into dangerous close encounters with the gang leader she believes to be her lost love. Jodi is willing to do anything to protect Shadow, but her actions lead to upsetting consequences. As she gets closer to Shadow, she will be forced to choose between protecting the boy she’s always loved and saving the lives of innocent people. Could one little moment really change everything? Sapphira Farraday is living the life of a typical wealthy teenager in England, but everything changes when she knocks over a bottle of perfume, leading her to witness a murder. Sapphira escapes, living in fear of being hunted by the killer, known to her only as Destiny. Feeling her life may be over at any moment drives Sapphira into making some impulsive decisions. Still, no matter what she does, Sapphira finds herself forced into a world of magic and deceit she wishes she never knew existed. “My name is Ethan Abbott, and I live in the town where it never stops raining.” That’s how I always introduce myself to people. It’s the only remarkable thing about my life. I’ve got a crappy job and a band that’s going nowhere. No one wants to know about that. Everyone just wants to hear about The Town of Raindrops. That’s what they officially renamed my town about a year ago. That’s what the letters say. Because it’s been raining here for six years, and no one knows why.